The Board Treasurer, 2nd Ed. • Some association records must be kept indefinitely and others can be tossed at the end of the year. • Only two types of investments are appropriate for associations that strive for safety and liquidity. • Associations have tax filing alternatives, and they can use a different one each year to suit their circumstances. • All associations, regardless of size, should have an audit performed each year. • Board meeting minutes should document financial activities like transferring funds, changing signatures on a bank account and writing off assessments. • Associations whose delinquencies amount to three percent or less of total annual assessments are considered to be in excellent financial health. • Some associations must pay—not only income taxes—but personal property taxes, real estate taxes and payroll taxes. • If an owner takes out a personal home-equity loan to pay a special assessment, the interest might be tax deductible for the homeowner. • Borrowing to pay for big-ticket projects allows the association to maintain its reserves and increase assessments gradually and uniformly over the life of the loan? 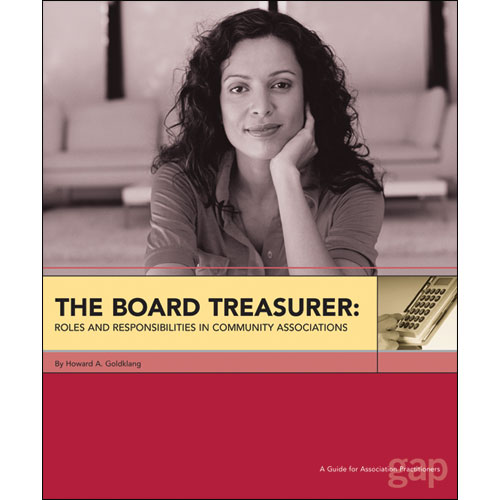 All this—and more—can be found in The Board Treasurer, Roles and Responsibilities in Community Associations, 2nd edition. You want to serve your community. You run for the board of your association and you're elected. At your first board meeting, you're appointed to the office of treasurer. You know that as treasurer you hold a critical position within the community. But you are unsure of the responsibilities of the position. This guide is written specifically for the treasurer. However, the information and guidelines on critical areas of community association financial activity that it contains will be of interest to anyone involved in community associations—managers, volunteer leaders, informed homeowners, and even the financial professionals who serve them. Some of these areas include: investments, reserves, financial statements, income taxes, budgets, borrowing, and special assessments. This report helps volunteer leaders decide what to do and who to turn to for financial advice. With this information, the treasurer and members of the finance committee can voice the financial needs of the community. The treasurer is the financial voice of the board and the community. The treasurer is the board's liaison to the association's auditor. He or she should monitor the progress of the annual audit. Make sure that appropriate tax returns are filed on time. The treasurer should implement a reserve program based on an engineering study and make sure it has adequate funding. The treasurer should ensure the implementation of an annual operating budget. The treasurer should implement safeguards to protect association assets.